The twelfth episode of Sledge Hammer was titled Miss of the Spider Woman and was the twelfth episode of the show’s first season. An unfortunate error sees Sledge poisoned with snake venom with just hours to live. In this podcast Gerry and Iain focus on the inspector’s race against time. 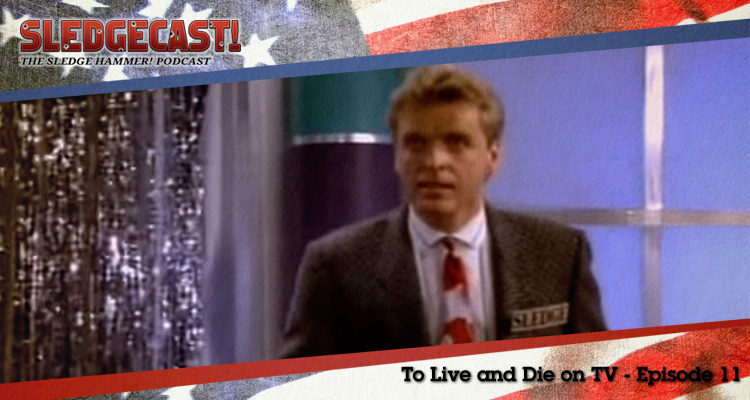 The eleventh episode of Sledge Hammer was titled To Live and Die on TV and was the eleventh episode of the show’s first season. When a gameshow contestant turns up dead before playing for $1m, Hammer puts his General Knowledge to the test. In this podcast Gerry and Iain look at some great teamwork between Dori and Sledge. The tenth episode of Sledge Hammer was titled If I Had a Little Hammer and was the tenth episode of the show’s first season. Hammer and Doreau pose as prospective adoptive parents to smoke out a baby-stealing operation. In this podcast Gerry and Iain look at a unique challenge for Hammer. 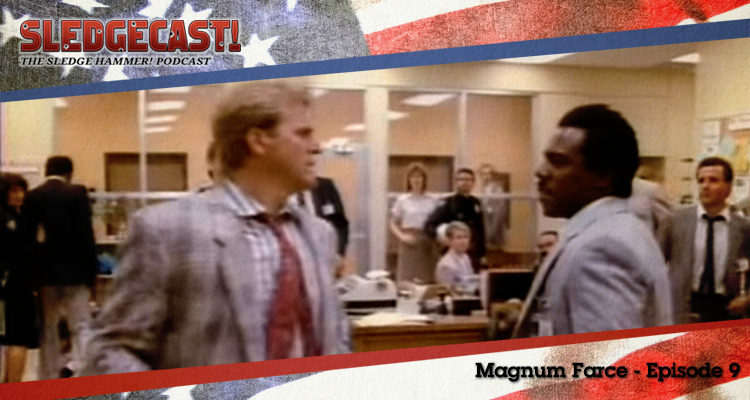 The ninth episode of Sledge Hammer was titled Magnum Farce and was the ninth episode of the show’s first season. Sledge infiltrates a group of vigilante cops to put a stop to their killing spree. 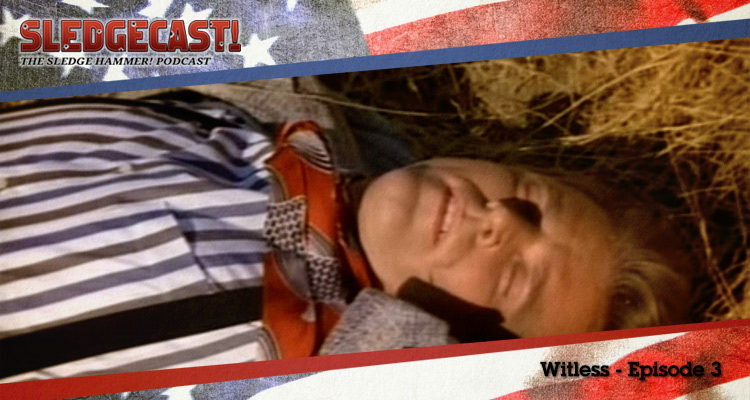 In this podcast Gerry and Iain look at Sledge’s attempts to go undercover. 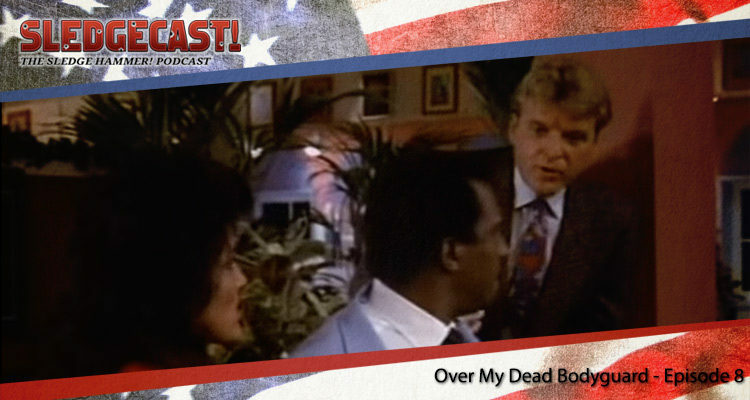 The eighth episode of Sledge Hammer was titled Over My Dead Bodyguard and was the eighth episode of the show’s first season. Sledge steps up to protect Captain Trunk when his life is threatened. 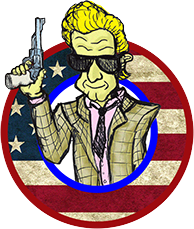 In this podcast Gerry and Iain look at the developing respect between Hammer and Trunk. The seventh episode of Sledge Hammer was titled All Shook Up and was the seventh episode of the show’s first season. 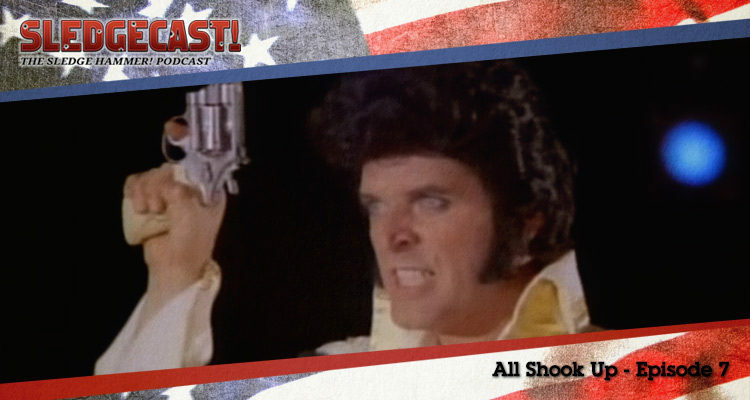 Sledge acts as bait when a serial killer starts murdering Elvis impersonators. 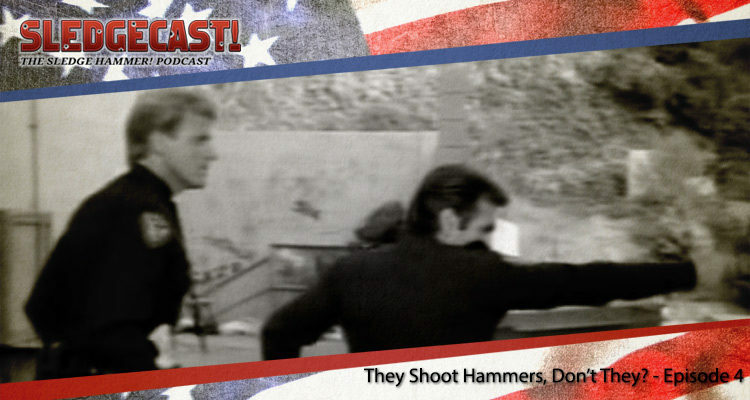 In this podcast Gerry and Iain look at some stylish undercover work from Hammer. The sixth episode of Sledge Hammer was titled To Sledge, With Love and was the sixth episode of the show’s first season. Sledge is assigned to a local high school when staff struggle to control a group of rowdy teenagers. 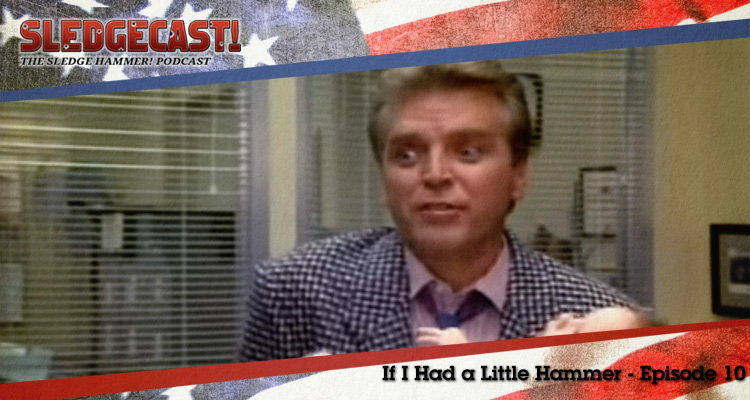 In this podcast Gerry and Iain look at more character development for Hammer. 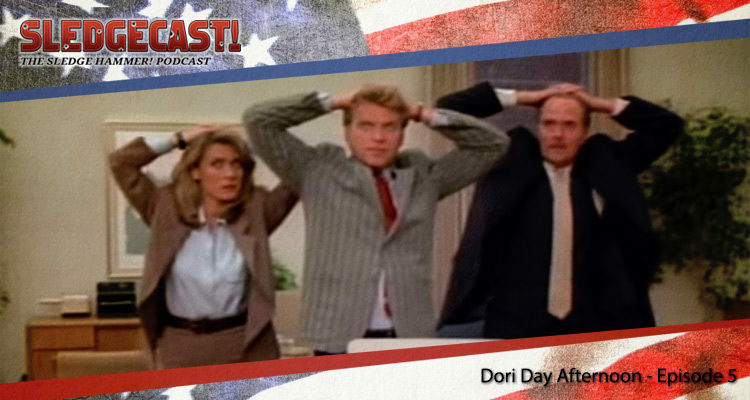 The fifth episode of Sledge Hammer was titled Dori Day Afternoon and was the fifth episode of the show’s first season. Dori and Sledge are held hostage during an armed bank robbery. In this podcast Gerry and Iain look at how the show worked in a largely single-scene setup. The fourth episode of Sledge Hammer was titled They Shoot Hammers, Don’t They? and was the fourth episode of the show’s first season. Sledge’s former partner escapes from prison and begins a violent rampage, demanding a showdown with Hammer. 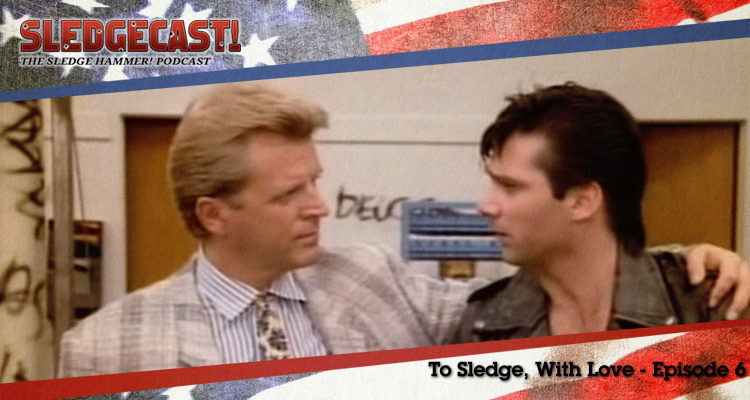 In this podcast Gerry and Iain look at some character development for Sledge. The third episode of Sledge Hammer was titled Witless and was the third episode of the show’s first season. A mafia godfather puts a price on Sledge’s head and Hammer is forced to go into hiding. In this podcast Gerry and Iain look at an early change of pace for the show.